This eyeshadow palette smells absolutely incredible! It literally smells like chocolate and I did not imagine it to be as heavenly as it truly is. 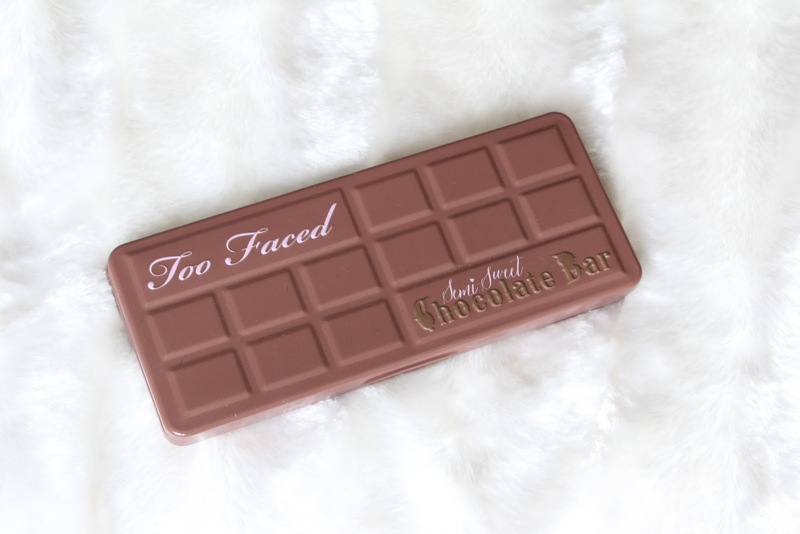 Even if you don't fancy going out and buying this palette, I would definitely suggest giving it a good sniff next time you're at your local Too Faced stockist department store. Although I will warn you now that you may want to eat it (please do not, I can imagine that it would make you feel rather ill). As you can see, most of the shades are pretty wearable as they are all warm brown tones. There is also a jet black, bright deep blue and sparkly pink which are less wearable but can still be worked with. These shadows are all very pigmented but not too much so that they're not blendable - they're very creamy. L-R - Licorice, Coconut Créme, Nougat, Truffled, Hot Fudge, Cocoa Chili, Pink Sugar, Puddin', Blueberry Swirl, Peanut Butter, Frosting, Rum Raisin, Mousse, Caramel, Bon Bon and Butter Pecan. 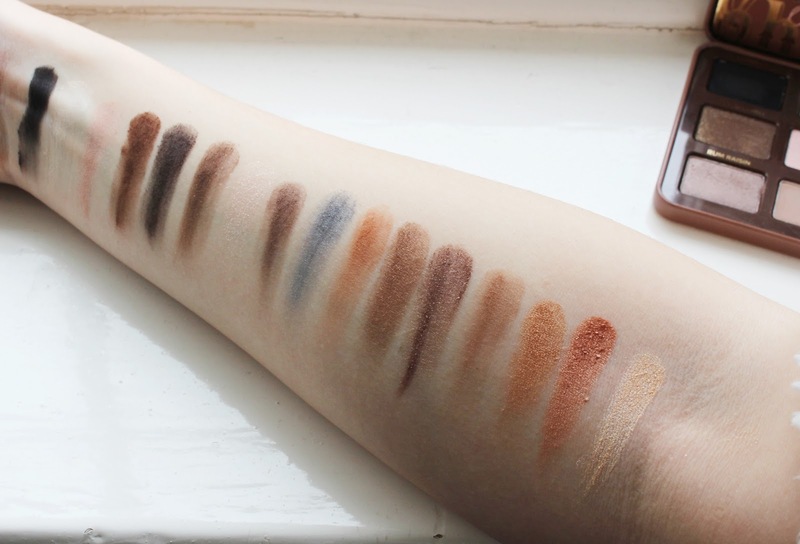 I did a swatch of each of the eyeshadows and I only rubbed my fingers in the shadow's a few times and then did one swipe down just so that you can see how pigmented they are with one swatch. Liquorice - Jet Black. Very pigmented black, however looks can be deceiving. This black can be built up to the extreme intensity that you see in the pan. If you use a small amount then it won't be completely jet black. Coconut Créme - Pure creamy coloured white. Great as a base shade to layer a coloured shadow over the top. As you can see by the swatch, it pretty much blends into the skin on my arm (I am very pale) but on the eyelid it is more noticeable as a pale cream/white shade. Nougat - Soft brown with a slight hint of pink. I tend to use this shade in the crease if I am wearing eyeshadow during the day as it's a very soft taupe-y/pink brown. Truffled - I love the name of this one! As you can see, it pretty much looks like a melted truffle in the pan - hence the name. I use this one as a crease shade to give my crease some depth and I usually tend to use Truffled for a slightly heavier smokey eye. Hot Fudge - If I could eat this one, I definitely would. Amazing name again and it's a deep dark brown shade. Perfect for a smokey eye as it's nearly black but not quite.I normally use this eyeshadow on the outer third of my eye when creating a dramatic smokey eye. Cocoa Chili - This shadow is absolutely gorgeous! A rich, true toned brown with sparkle. This would be perfect as an all over lid shade if you were creating a very intense smokey glittery eye. Pink Sugar - A very cute sparkly baby pink shade. Perfect for a subtle everyday 'glamour' look. As you can see by the swatch, it's not highly pigmented so I would suggest maybe wetting your eyeshadow brush with a little fix+ by M.A.C (or something similar) as this may help with the pigmentation. Puddin' - Purple/grey toned brown. I tend to use this shade on the outer third of my eyelid if I'm creating a less intense smokey eye as it's definitely not as dark as Hot Fudge. Blueberry Swirl - Dark navy blue with a little shimmer. This shade would be so fun for a more 'daring' smokey eye with a pop of colour - either as an all over lid shade or just focused mainly on the outer third. Peanut Butter - a.k.a My favourite shade name ever! This is a nice orange toned brown (it basically does look like Peanut Butter!) I love using this shadow in my crease during the Autumn months to create that orange-y 'Autumnal' look. Frosting - A lovely woody brown shade with a slight glimpse of shimmer to it. A great shade all over the lid for a super smokey effect or it can be a less intense smokey look by being applied to the outer third of your eyelid. Rum Raisin - A very shimmery light brown/taupe shade which would look really lovely all over the lid with a light brown shade in the crease to create a daytime glam look. Mousse - Definitely the most wearable shade out of the whole palette. It is this perfect light brown crease shade just for some light definition and is also amazing for building up the crease colour by being the first shade which you can then layer on top of with some darker browns. Caramel - I am in love with this golden shade and I tend to apply it all over the lid as it really makes your eye come to life and looks very glamorous. It is definitely one of those 'evening' wear shades if you build it up and it's super pigmented. Bon Bon - Similar to Caramel as it's super shimmery and applies the same and would also be worn the same way. Bon Bon is a very beautiful bronze shade and is also very pigmented. Butter Pecan - A perfect beige/peach highlight shade! I normally use this shade in my inner corners/tear ducts and I also use it to highlight my brow bone. If I'm fancying a daytime look with my eyeshadow, then I normally wear Mousse in the crease and then just apply Butter Pecan all over the lid to really make my eyes glow subtly. All in all, I absolutely love this palette and it is perfect for creating different looks ranging from day to night. I believe that all of the shades within this palette are pretty wearable and I highly recommend this palette to anyone - whether you are starting out in makeup or are very experienced with it. the chocolate bar palettes are amazing. i own both and i love them so much. they are probably the easiest to blend. I adore how they make their products smell like chocolate! I really want to try more from the brand. This eye shadow palette looks gorgeous. This palette looks so beautiful. I love the brown warm colors. 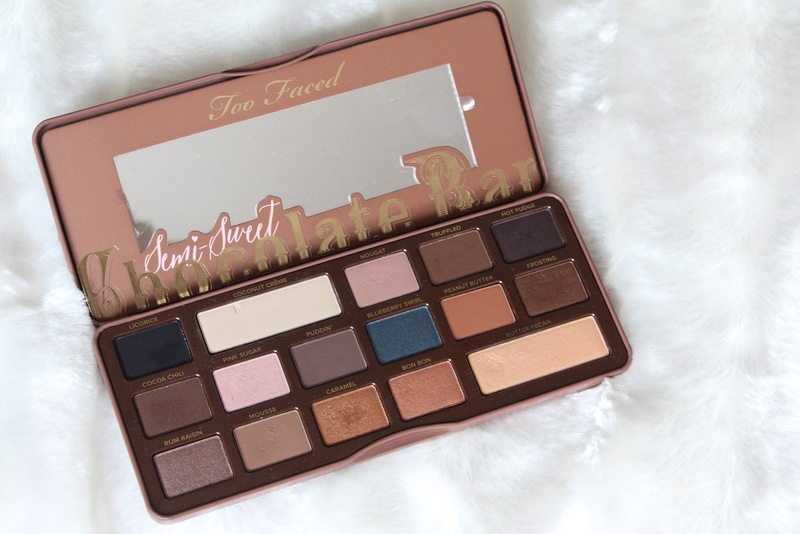 I have the original chocolate bar palette and it's one of my all time favourite palettes. I'm contemplating whether I should get this palette too! All the shades are so gorgeous and I love their eyeshadow formula!